The Vollrath VCBA128-37 frozen drink machine has two 1.58-gallon bowls, so operators can chill, freeze, and serve multiple drinks with the same unit. Slushes, smoothies, and frozen cocktails work well in the machine, and alcohol can be added to the hopper without damaging it. Each bowl is controlled independently with a frozen beverage mode and granita mode. Lights in the bowls attract attention to help merchandise product. Cleaning the spigots is simple since they are made without gaskets. 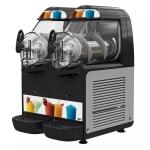 You can learn more about this unit by reading our frozen drink machine buyers' guide.